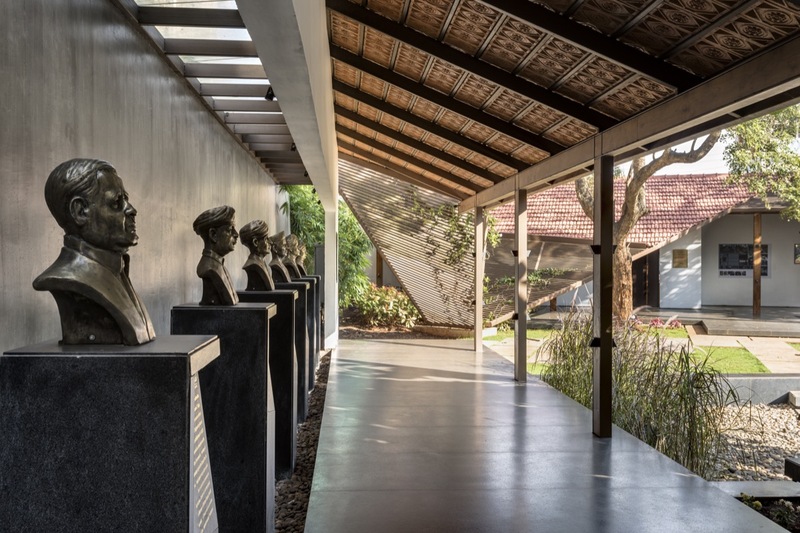 A hundred years ago, in 1916, seven young men returned to their hometown, Belgaum and established a modest charitable organization for the betterment of education in the region. 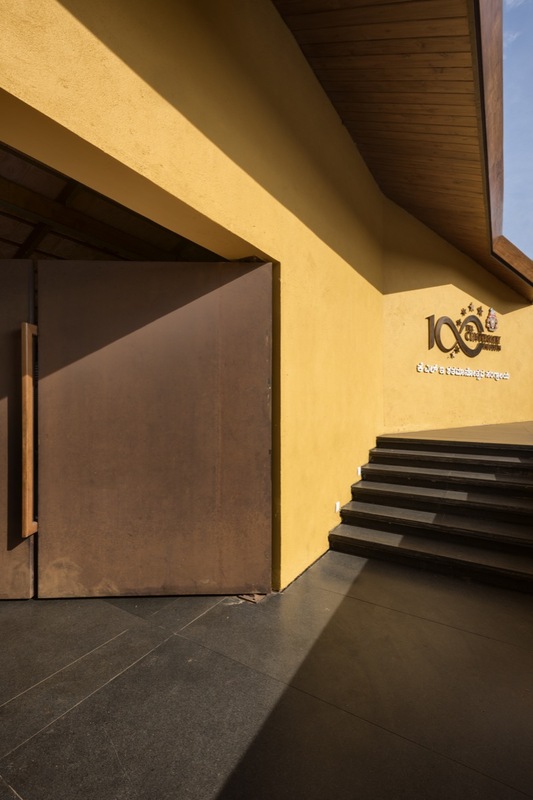 They were helped by three local landlords who saw their potential.The organization thus formed, the KLE society, that started with a humble Anglo-vernacular school in 1916 is now a behemoth spanning 250 + institutions with a footprint across the country. 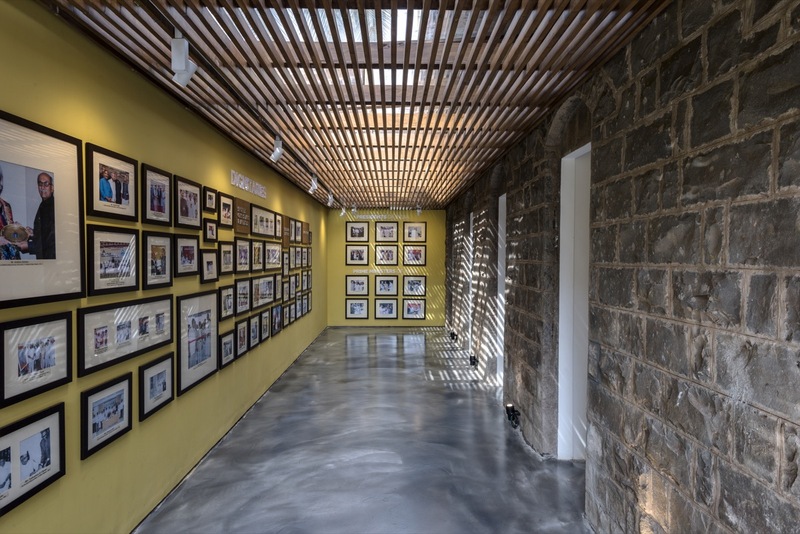 The building selected to house the museum was an 80 year old, modest dilapidated structure in the main KLE campus in Belgaum. 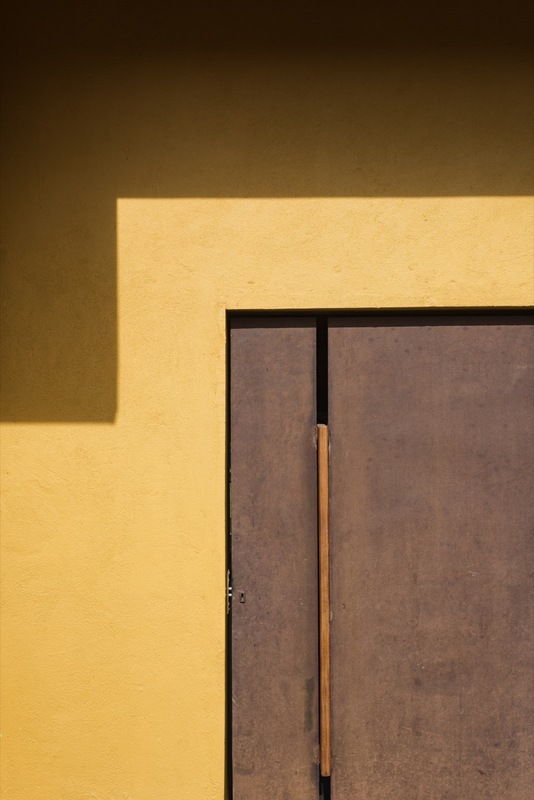 At various times in its life, this stone and timber building served various functions. 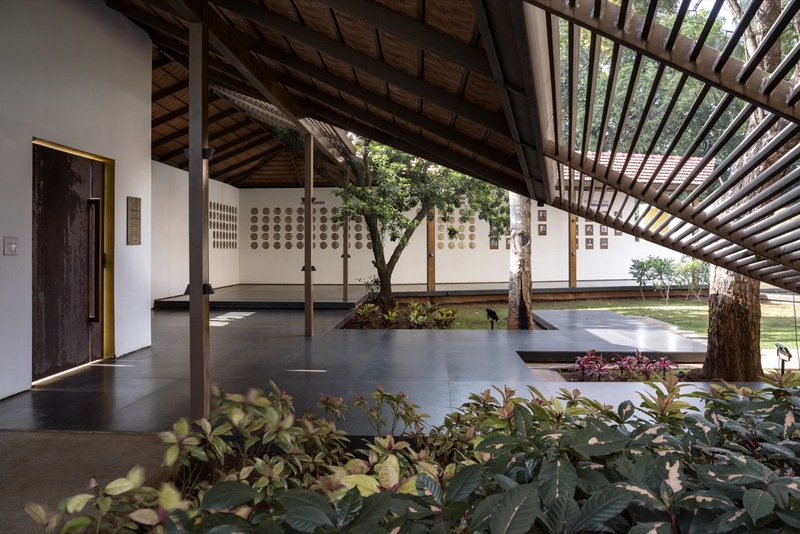 The museum display is conceived as a chronological narrative, and it is not contained solely within the restored building, but is extended into the site by the addition of two pavilions that are interspersed into the landscape. 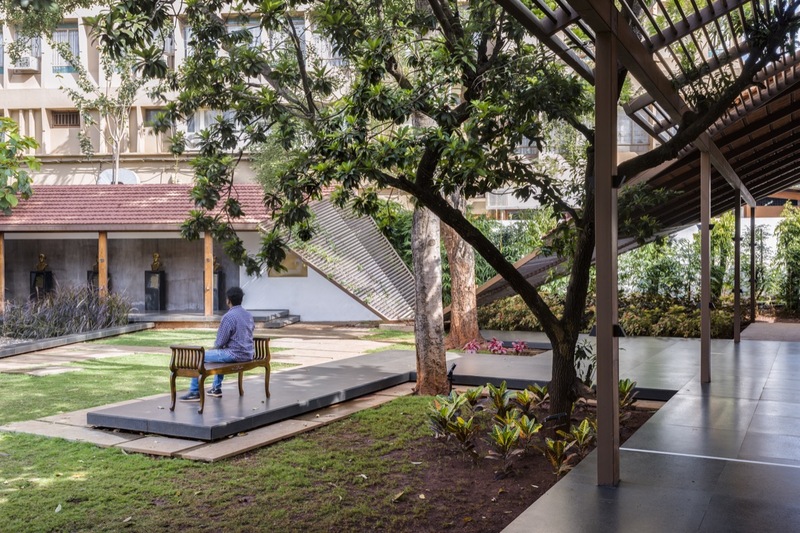 The existing trees on the site were not only retained but the two interlinked pavilions were generated around them, thus making them focal points. 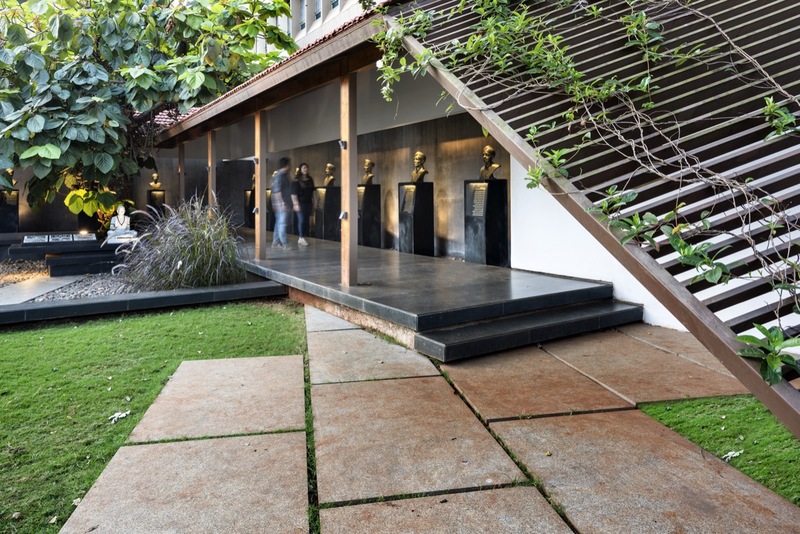 As one enters the museum complex from the road, he/she has to access the heritage building through the ‘Pavilion of the Saptarishis’. 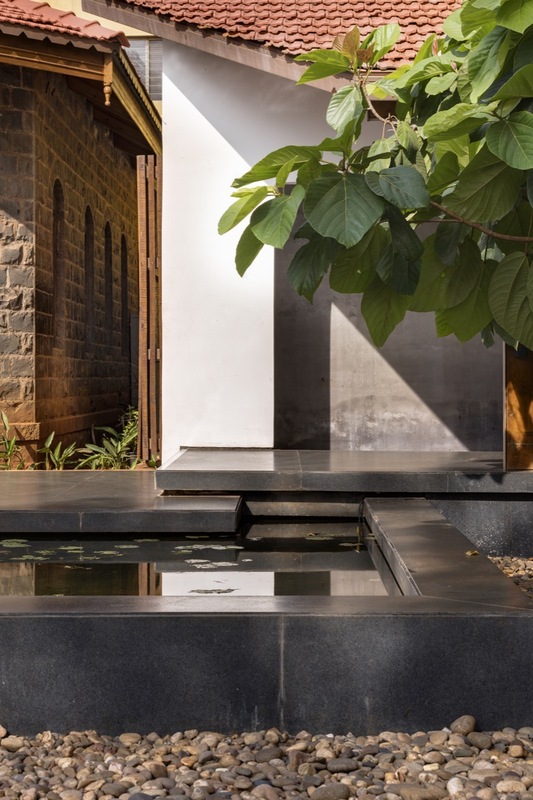 This pavilion is a simple L shaped clay-tile roofed walkway that is laid around an existing fig tree. 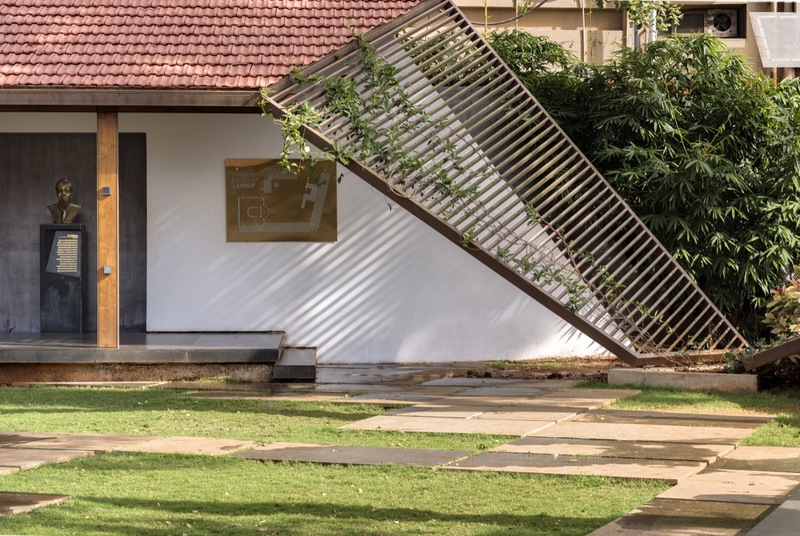 One part of the L shaped pavilion celebrates these seven saptarishis(founders), whereas the other smaller part of the pavilion immortalizes the three donors. 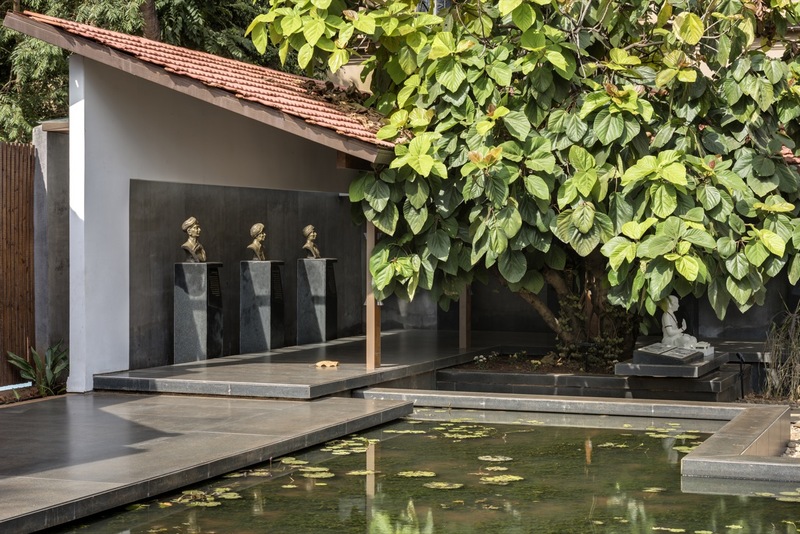 At the base of the fig tree is a statue of the 12th century reformer Shri. Bashweshwara whose philosophy and teachings the KLE society is inspired by. 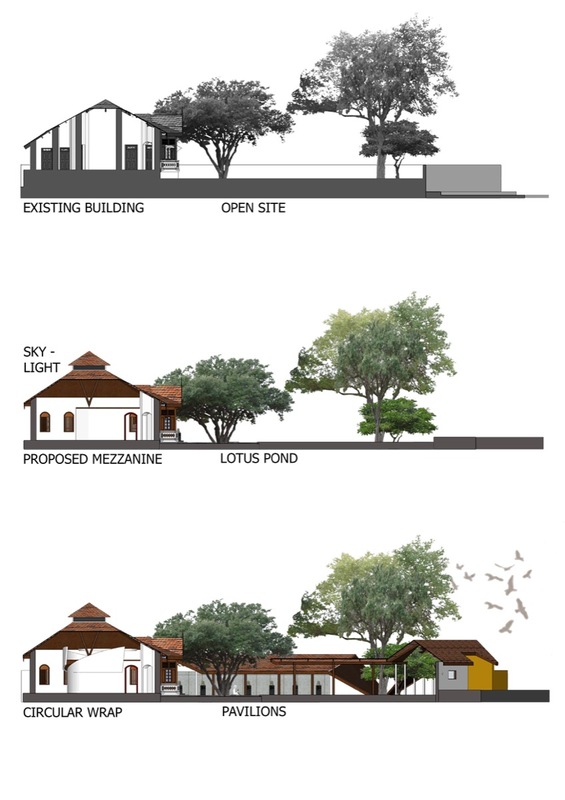 A lotus pond in front of the heritage building gives a reflective foreground to the building and also ensures that entry is only through the Pavilion of the Saptarishsis. 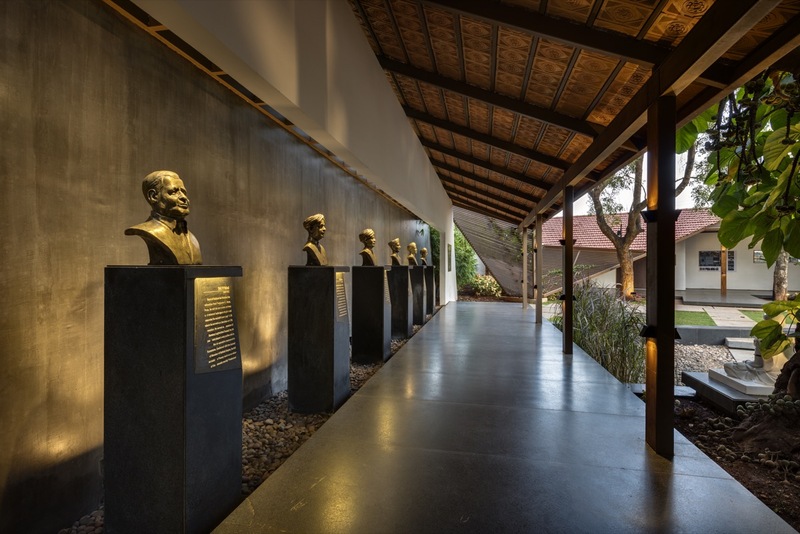 The original building was an old basalt stone and laterite construction with closely spaced walls dividing the space into small cellular spaces, albeit with tall ceilings. 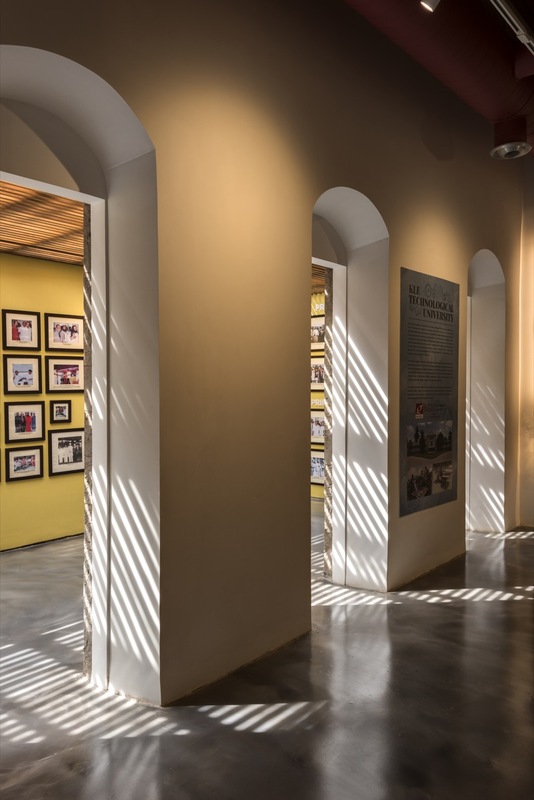 All internal walls, except for the central core and the entrance walls were removed to create a seamless exhibition space around the central core that also took the load of the pyramidal roof above. 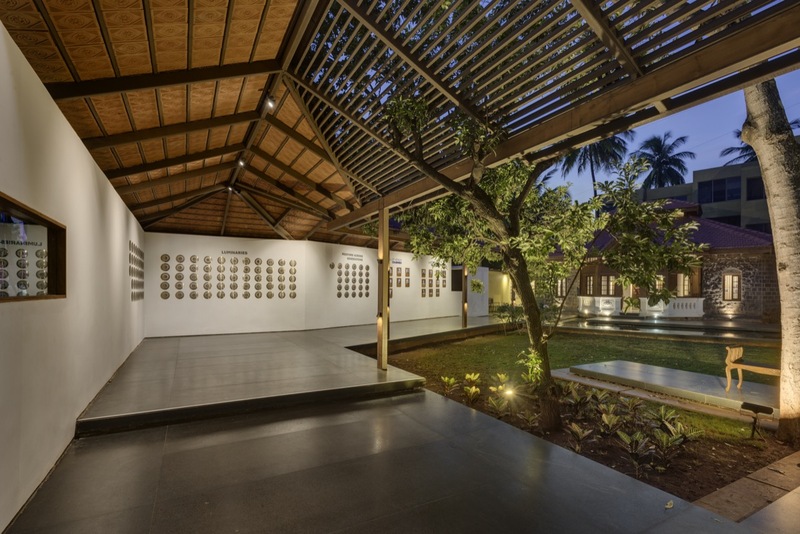 The height of the walls in the central region too was brought down so that the entire expanse of the roof could be seen from all points, thus visually integrating the space. 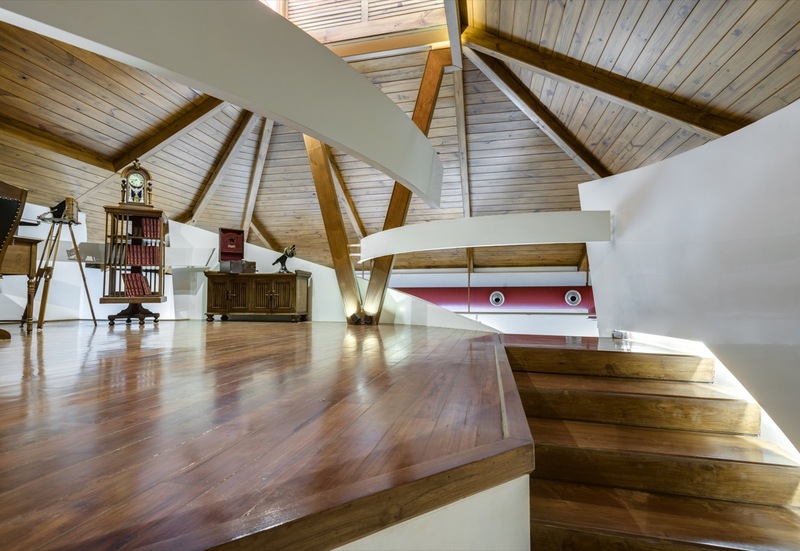 The central hall would function as an audio visual room, and a mezzanine was conceived on the top of this. 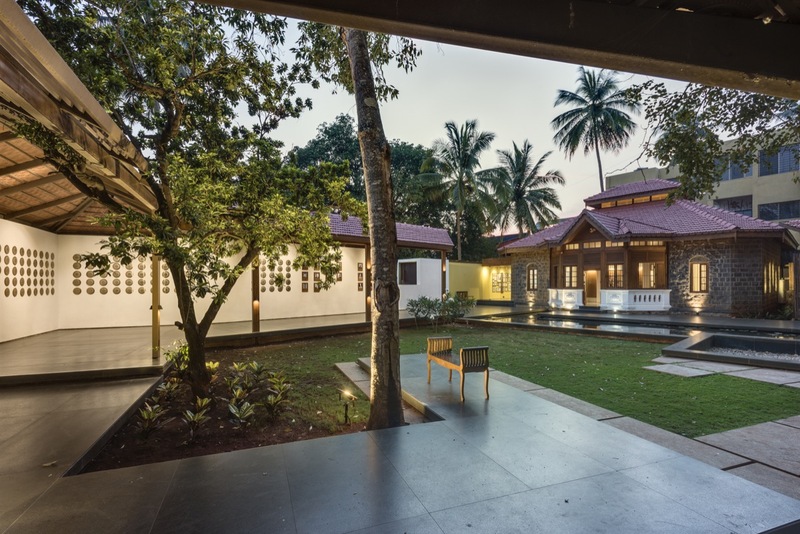 Minimum design changes were made to the original timber roof that was replaced with a new steel and timber roof with mangalore tiles. 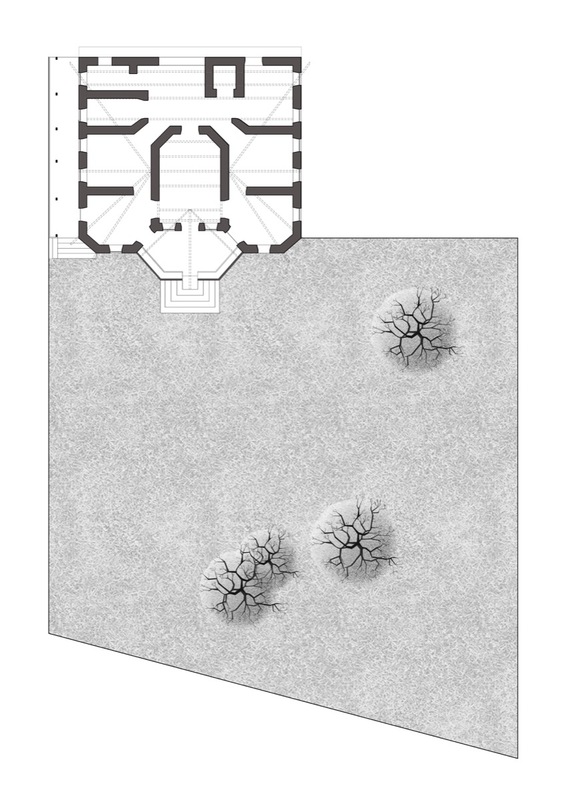 A clerestory to let in light and ventilation for a proposed mezzanine was the only design intervention. 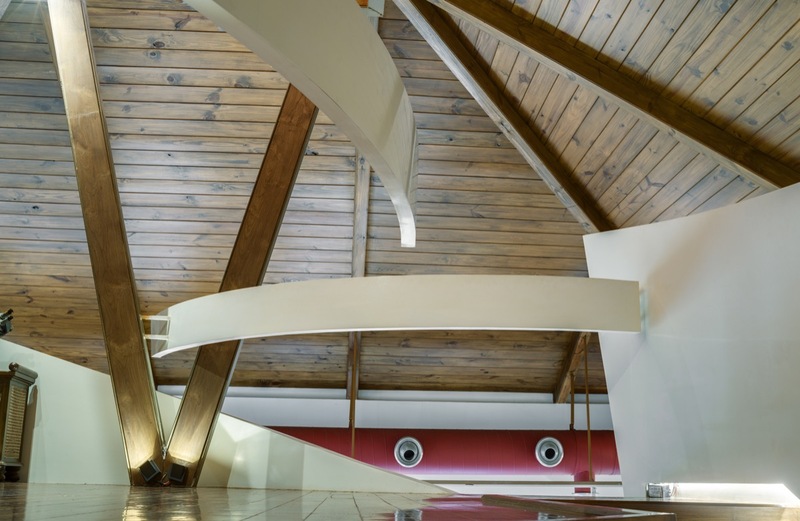 A curvilinear wrapped staircase was introduced around the central audio visual room that leads one to the mezzanine. 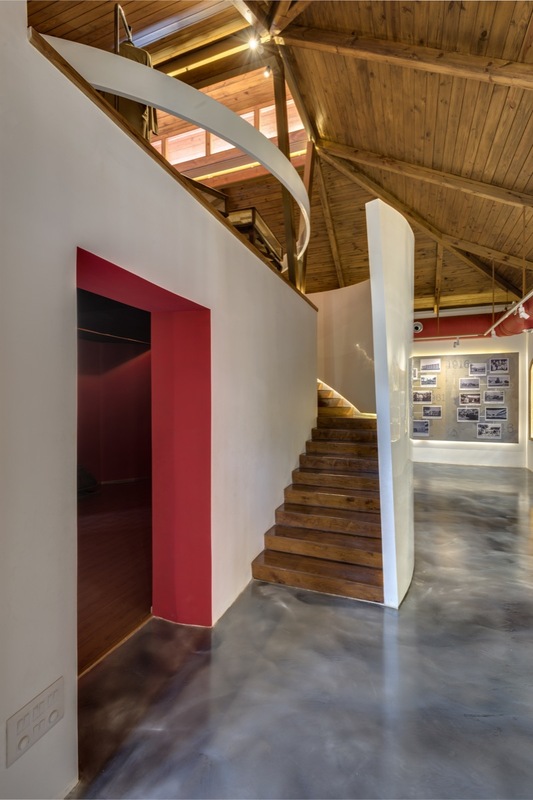 The curvilinear stairs and wall form an armature around which the interior display spaces are ordered. 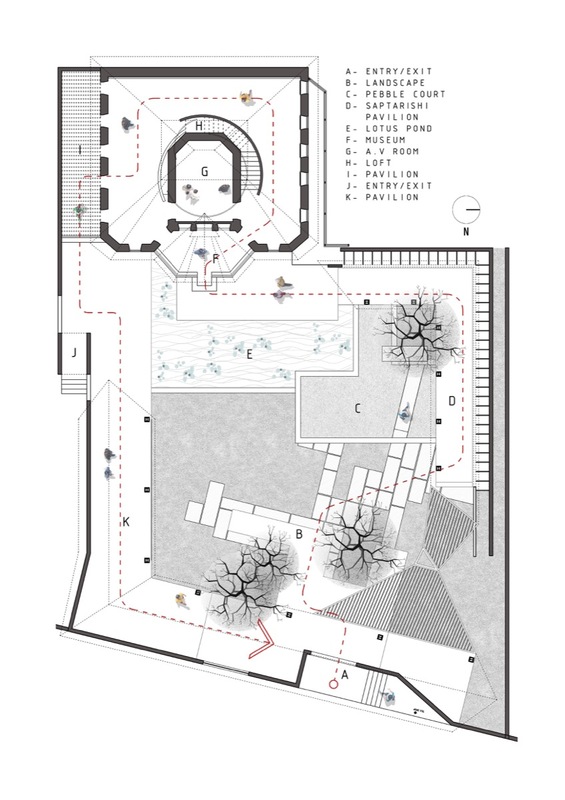 The armature unfolds and peels into several layers and becomes a dynamic ordering device that propels movement through the otherwise static space. 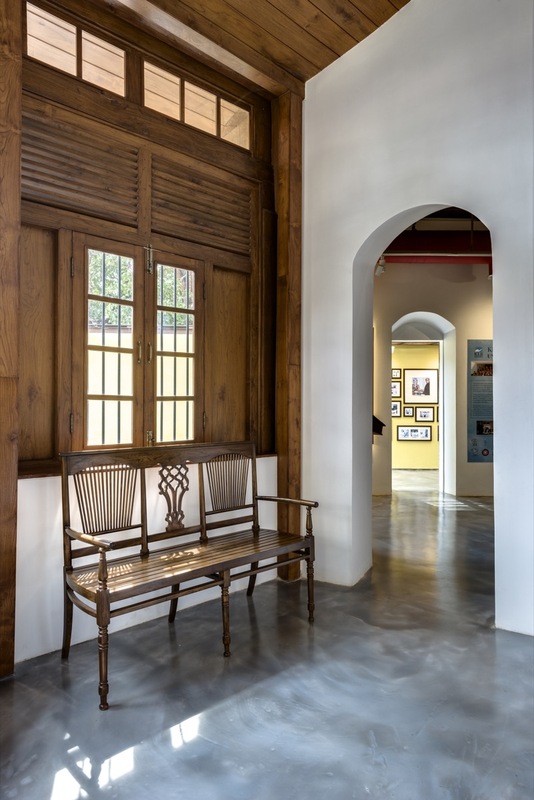 With its white peeling layers juxtaposed with curvilinear railings, it is simultaneously a circulation and display space. 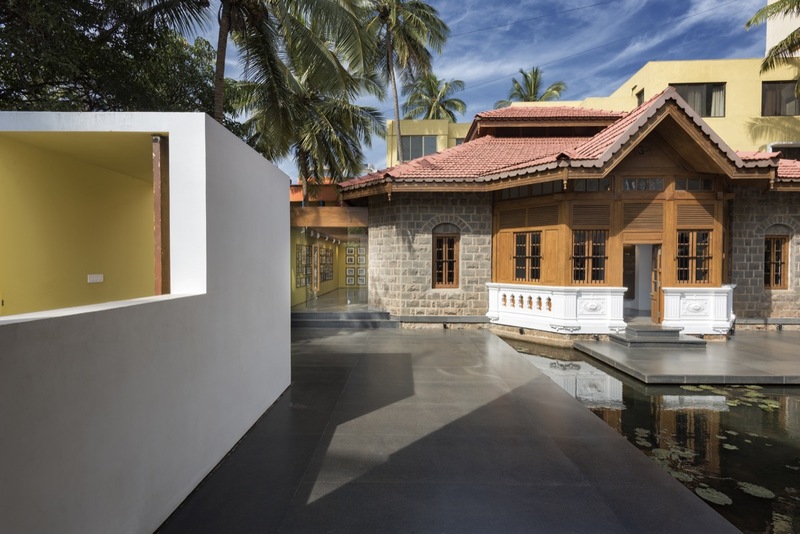 Another addition to the main structure is a glass enclosure that abuts the building and serves as the exit point. 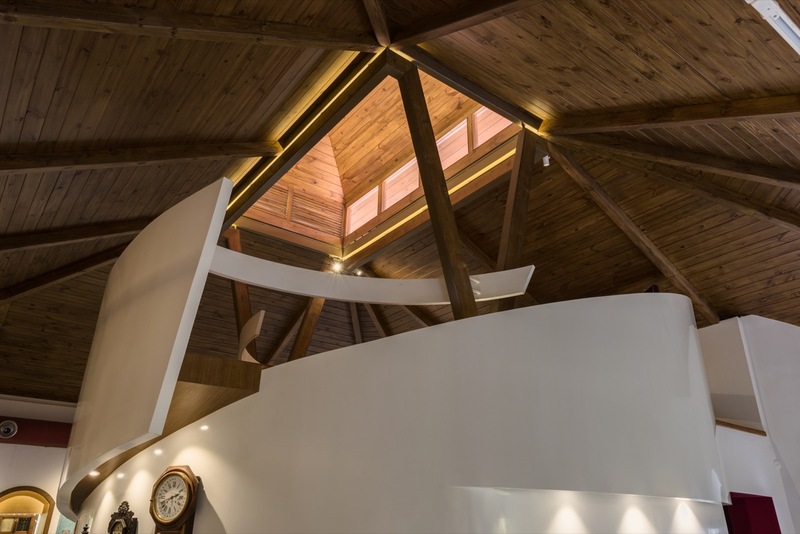 Teakwood lattice below the roof filters and tempers the sunlight in this space. 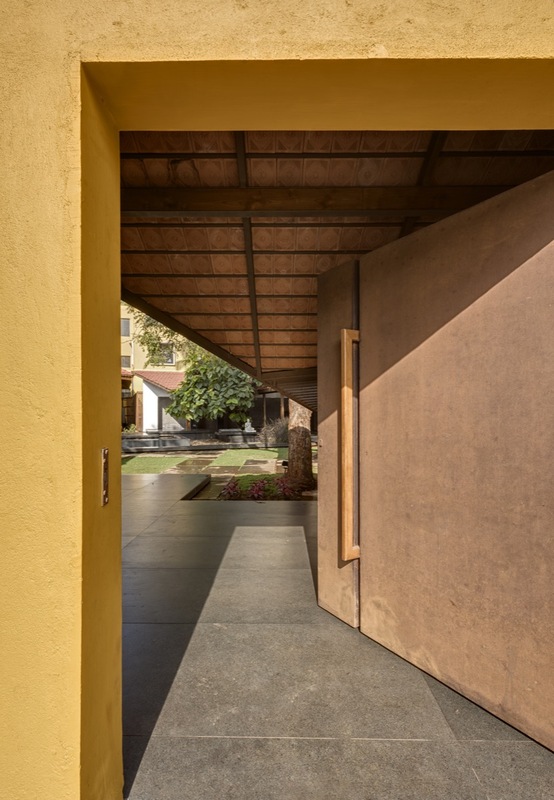 Spatially, this glass and wood enclosure is conceived as an in-between space between the building and the landscape and signals the movement from the building back to the landscape. 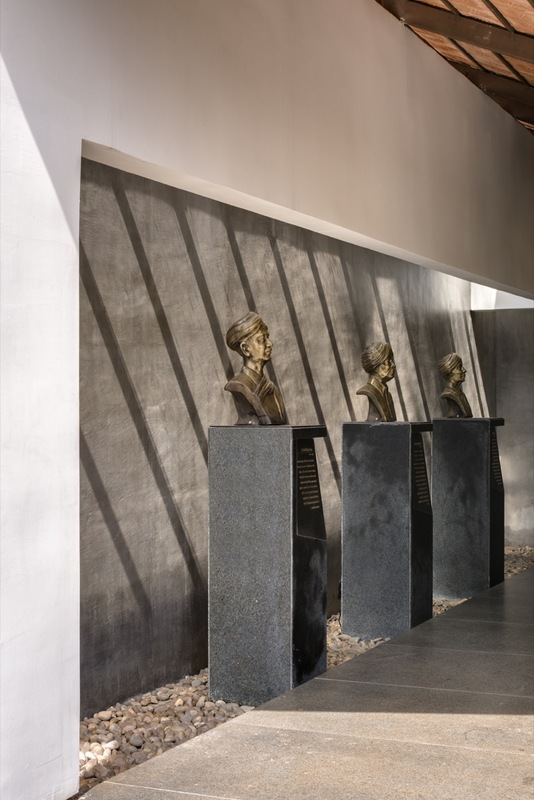 This section commemorates all the important people who visited the various KLE Institutions, from presidents and prime ministers to great scientists like Shri. C. V. Raman. 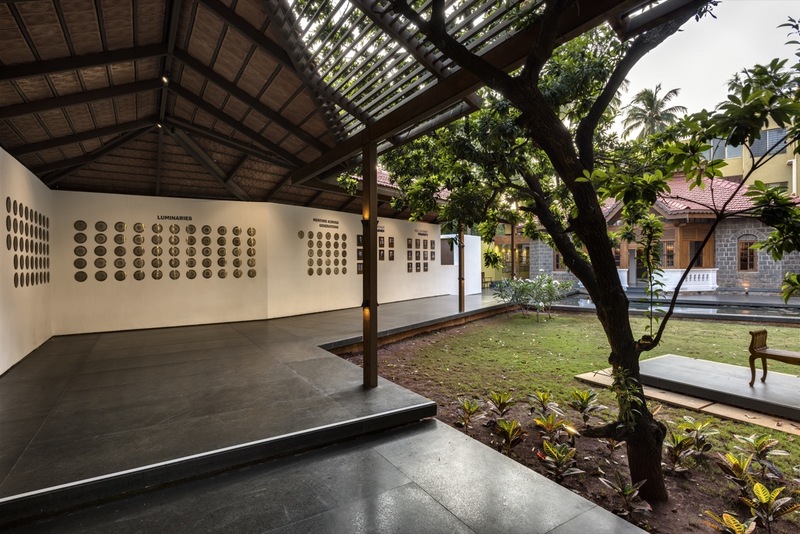 The pavilion, on exiting the museum celebrates the alumni and teachers of the organization that went on to achieve greatness in their respective fields. 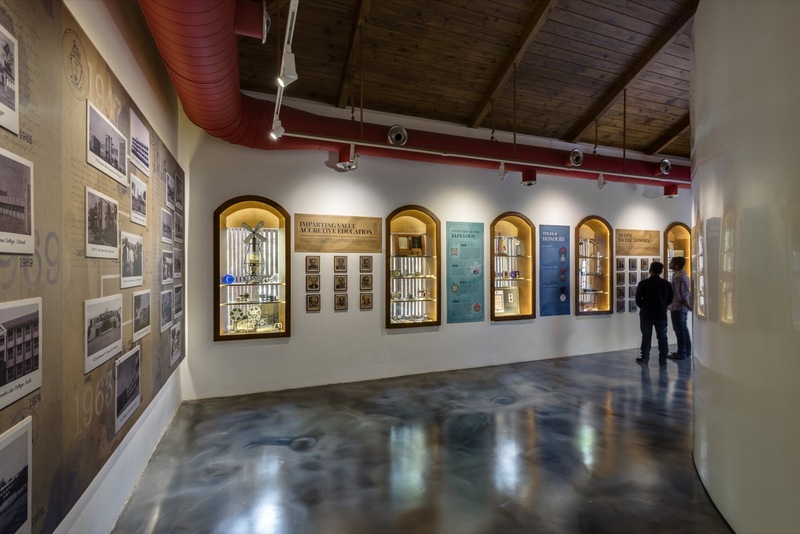 The museum is ordered around a linear chronological narrative that spans the history of the KLE society through the last hundred years. 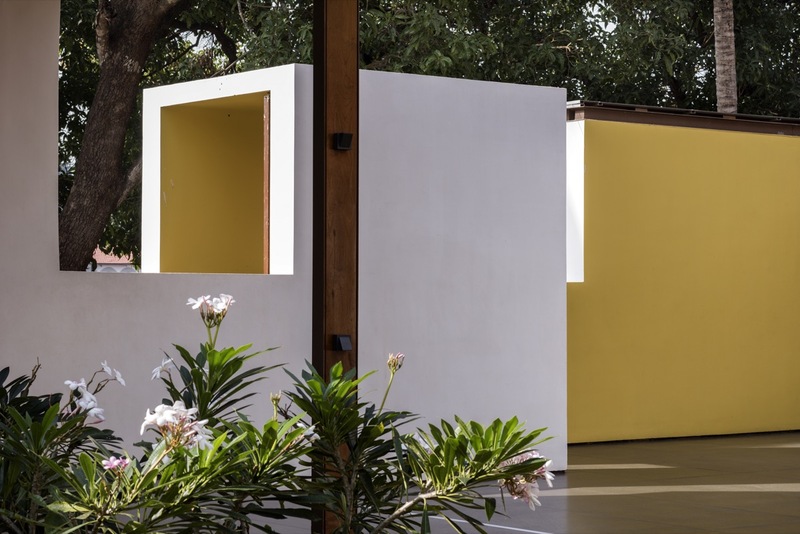 The history of the society unfolds episodically as one walks through the space entering through the main entrance and starting from the right, and finally exiting from the glass pavilion on the left. 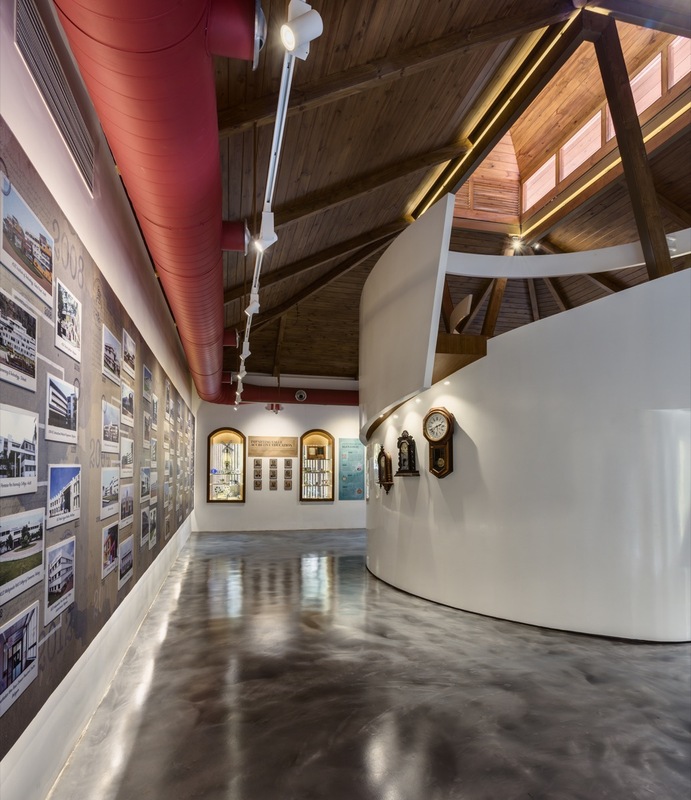 By respecting and paying homage to the original architecture of the well-crafted stone and timber building, yet reinterpreting it in a contemporary fashion, the past is sought to be re-contextualized with the present, while concurrently, the future is tempered with the distant past. 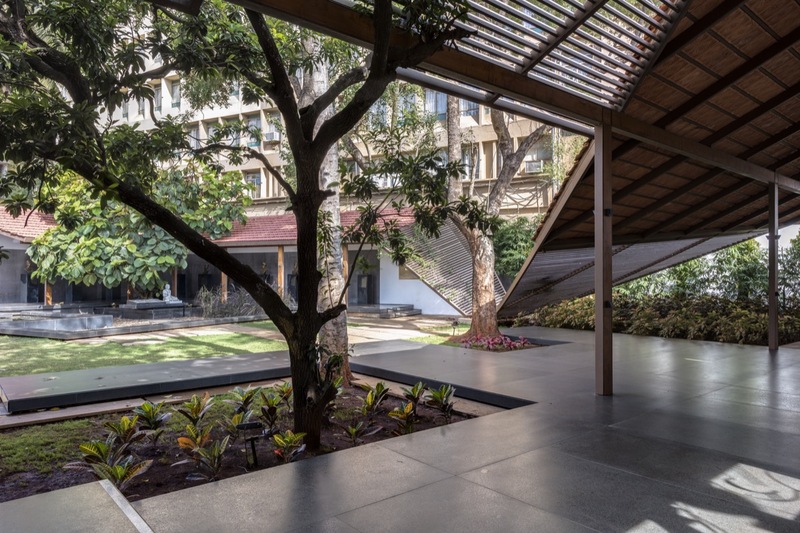 In a way, the latest avatar of the building was not meant to be just another in a series of transformations of its function, but it was also intended to preserve at least a part of a depleting built heritage in the campus that houses some of the oldest institutions of KLE Society. This small building, in many ways, is emblematic of the domestic architectural heritage of this once quaint town, a heritage that is sadly being replaced by rampant uncontrolled growth. 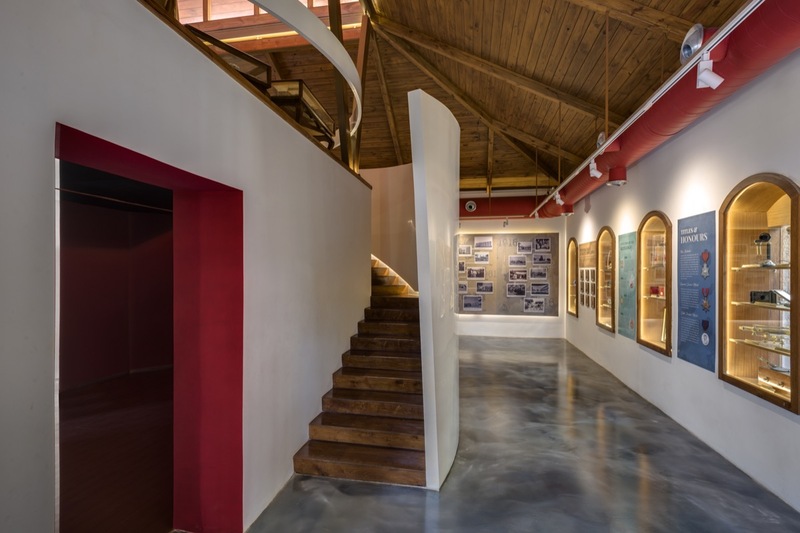 In a way, the museum would be not just about the KLE society, but would also be an important public space that makes people aware of the architectural legacy of their hometown.